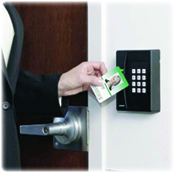 Ingersoll Rand Security Technologies announced availability of its new Schlage SXF2110P-K mid-range keypad/proximity card reader for applications utilizing legacy proximity systems and still wish to incorporate two-step verification to gain access. Operating at 125 kHz, the reader provides an up to six-inch (15.24 cm) read range and integrates into existing proximity-based access control systems, and is compatible with most proximity credentials. The SXF2110P-K mid-range keypad/proximity card reader is manufactured with quality UV-resistant materials, reducing discoloration in different environmental conditions, including direct sunlight. They also feature potted electronics and circuitry for protection against inclement weather.